Since our history and science curriculmns overlap often, completing a 7 Days of Creation project was a great combination to both subjects. (Affiliate Links) We are using the Mystery of History and Christian Kids Explore Creation Science. I found the Lego green and blue boards to be great foundations for building the 7 days of creation project. Since days 1, 2, and 4 don’t really require building our Lego building focus was on plants, land animals, and sea creatures. Sometimes you need to look for an experiment that has dramatic changes. The Ivory Soap experiment does just that. We have been enjoying our lessons with Christian Kids Explore Chemistry and today we added an extra experiment to our science plans. In 1837 Mr. Proctor and Mr. Gamble began making and selling soap and candles. During the Civil War government contracts to provide the Union Army with soap and candles kept the factory busy. In 1879 Mr. Gamble’s son developed Ivory Soap. Proctor and Gamble has a great PDF that outlines the history of their company. •Fill up the bathtub with some warm water. Allow your Civil War soldiers to hand wash their shirts with Ivory Soap. Did they notice that the soap floats? If you have some other kinds of soap, see if they can float. Soap is a form of matter because it takes up space. Describe its physical properties: size, shape, smell and color. •Using a bar of Ivory Soap and another kind of soap, have your students fill out this lab sheet for the Ivory Soap experiment. After two minutes in the microwave. 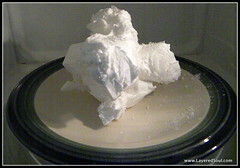 Steven Spangler shares information about Ivory Soap on his web site. •Explain how when Ivory Soap was first made it didn’t float. About 3 years into the manufacturing the gentleman who was running the machine forgot to turn it off and went to lunch. This whipped a lot of air into the soap. He didn’t say anything to his employer but packaged the soap and sent it the stores. Later mail started coming in asking for more soap that floated. Do you think the gentleman should have told his boss about his mistake? What does the bible say about God turning bad things into good? Or confessing your mistakes? Read Proverbs 21, verse 2 states: Every way of a man is right in his own eyes, but the Lord weighs the heart. Bonus Lesson: The boys learned some life skills and cleaned the inside of the microwave after heating up a bars of soap. A chemical reaction is when one or more substances become one or more different substances. A physical reaction is when you change the appearance of a substance and can return it to its original state. Now to do some experiments that demonstrates these two reactions. I choose to use a rusty piece of metal, Diet Coke and Mentos, and smoke bombs. First I placed the rusty metal on the ground and then set up the Mentos to drop into the Diet Coke. Even through my kids have seen the Mentos reaction before, they did not mind doing it again. Since I cannot make the rust return to being a metal, I have a chemical reaction. If I could catch the CO2, I could return it to the soda, and only a physical reaction has happened. Now since my chemical reaction is a little boring, watching metal rust, I decided to make smoke bombs. You need stump removal and sugar to make the smoke bomb. Stump removal can be found in the lawn and garden section near the pesticides. Taking 1 1/2 cups of stump remover to 1 cup of sugar and in a pan over low heat you want to caramelize the sugar. Once you have the dark brown liquid pour it into a blob on aluminum foil to cool. Once it cools, it will harden and then can be removed from the foil. We placed ours on a stepping-stone and made sure no flammable items (leaves/grass) were near the smoke bomb. We lit it with a lighter and watched the reaction. It was awesome! I got to be the cool mom for the day. Grab the chemistry supplies and safety glasses and let the kids have an unplanned chemistry lab. This week’s chemistry lesson with Christian Kids Explore Chemistry involved learning the names of the apparatuses used in a chemistry lab. Now I say unplanned, really I mean just let the kids play with the lab equipment, sometimes I can get caught up on doing all the proper learning I forget to let them play. I introduced the name of each apparatus and placed in on the table. Remember to wear you goggles in the Chemistry lab. Then I allowed them to measure water in the graduated cylinder. Move water back and forth with a pipette. How much liquid can your erlenmeyer flask hold? What are you going to put in your beaker? Keep your test tubes in the stand so they do not roll off the table. I heated a class of water in the microwave to measure the temperature. Every few moments I would ask them the name of the apparatus they were using. Then I would leave them alone to pretend what experiment they were performing. Since I have boys there was a lot of explosive reactions happening. Sometimes you don’t need a fancy science experiment to have fun. But having the fancy equipment can be very exciting when pretending to be a mad scientist. This week I am laying out our Christian Kids Explore Chemistry notebooks. I am pretty excited to be teaching chemistry this year! Although I love the experiments in the book, I am planning on adding two or three more to our class each week. I chose to keep the notebook divided by the units outlined in the book. Thankfully the CD that came with the book helped to print out the student pages for each lesson. I did make a section for vocabulary. My boys are already doing a lot of writing in their other subjects, so I typed up the vocabulary on address labels. Then I created a page with outlined boxes in two columns. Since the labels are white, I chose to print the blank boxes on yellow paper. My oldest does have an extra section for the elements. I found an extra book A guide to the Elements that gives a brief history about each element. Choosing 3 a week, he will do a notebook page on each element. My youngest will do the element cards as outlined in Lesson 4 of the book Christian Kids Explore Chemistry. If you are looking for more information, The Homeschool Scientist did a product review of Christian Kids Explore Chemistry.